In 1928 the children of Iwate Prefecture, Japan and the children of Birmingham, Alabama participated in a friendship project. The Committee on World Friendship Among Children sponsored this project. The children of Birmingham sent several dolls to the children in Iwate Prefecture, Japan. The children in Japan sent fifty-eight dolls to the United States. These dolls toured all over America and were later distributed among museums and libraries all over the country. Miss Iwate was the doll that was sent to Birmingham and placed in the Birmingham Public Library. The Japanese children sent thousands of letters with Miss Iwate. The letters explained that in Japan there is a festival each year called the Feast of Dolls which is held in honor of their favorite toy. 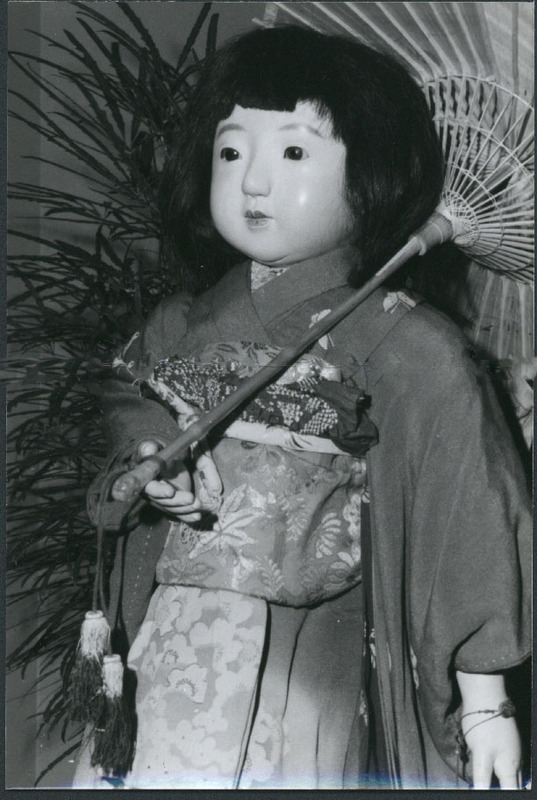 Dolls were precious in Japan with some being centuries old and handed down from mother to daughter. 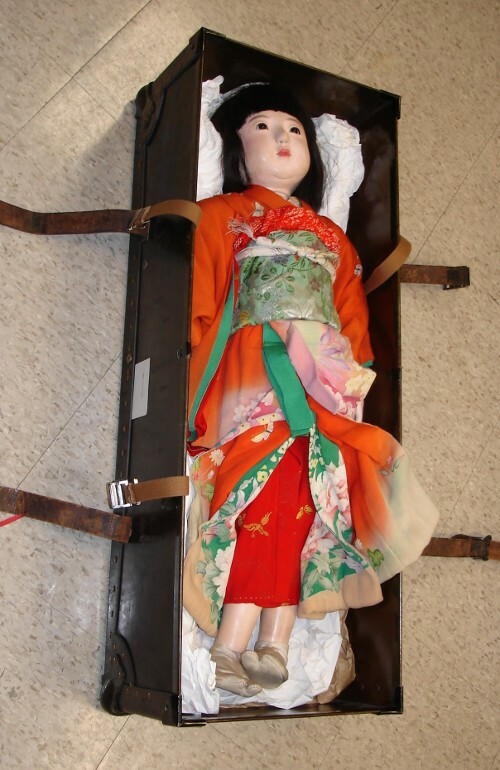 Miss Iwate, who is life sized, arrived in a black trunk with an extra trunk for her furniture. She has a chest of drawers, a sewing table, a complete tea service, two lanterns and two small dolls to keep her company. Over the years Miss Iwate has been on display at the Library for various functions. She was on exhibit during the Festival of Arts salute to Japan in 1967. Miss Iwate is available by appointment only. She cannot be held or touched. Miss Iwate is dressed in an orange, pink, and beige silk kimono with a floral design on the lower portion. The upper orange portion has a design of butterflies in gold. A mint green obi of floral brocade is tied around the waist; a white silk obijime (cord) with pink and green embroidery is tied over the obi. A red tie-dye obiage (sash) is tied at the top of the obi. Beneath the outer kimono, she wears an emerald green kimono with a design of pink peonies; the collar is white silk with pink and green embroidery. The collar shows around the neckline of the outer kimono. Underneath the green kimono, she wears a red underkimono with a design of gold butterflies. Finally, underneath it all, she wears white bloomers trimmed with lace. She wears white tabi (socks) made of woven cotton on her feet. She rests in a black steamer trunk that measures 35"l x 13.5"w x 9" h (89cm l x 34cm w x 23cm h). It has two brown leather closure straps. 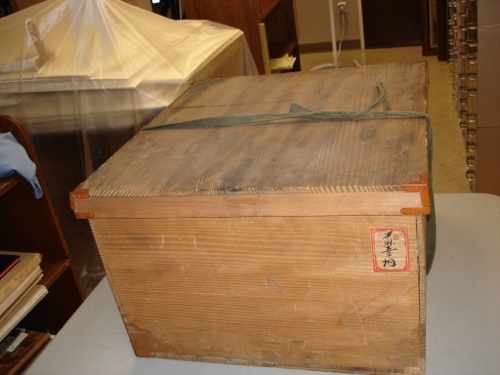 The top of the trunk is covered with shipping labels such as "Fragile" and "Handle with Care". At the center of the lid, "IDG New York" is written in orange paint. 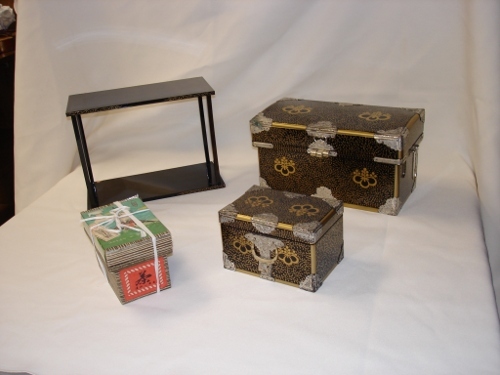 This wooden box with fabric closure ties contains a round brown lacquer box. 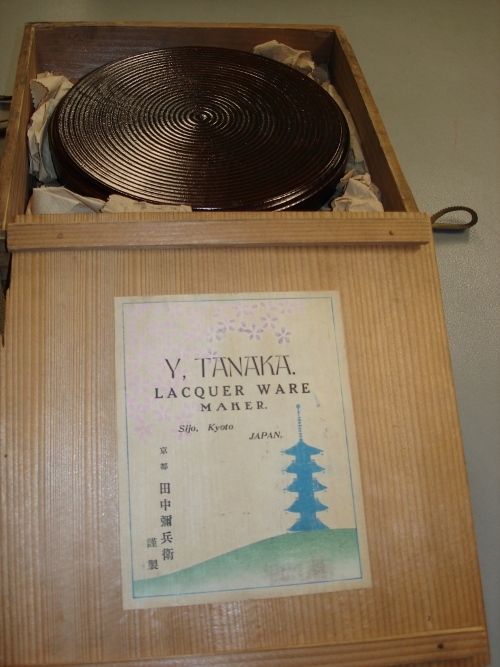 Underneath the box lid is a label stating "Y. TANAKA, LACQUER WARE MAKER". The same information is written in Japanese. The round box has a grooved design of concentric circles. The dimensions are: 7.5" diameter x 2.75" h (19 cm diameter x 7 cm h). Note that the lid of the round box can serve as a tray. Miss Iwate has two dolls of her own, a girl doll and a boy doll. The girl doll wears a silk kimono in orange-gold and cream with a floral design. A red and gold brocade obi is tied around her waist; a white cord (obijime) is tied over the obi; a red tie-dye sash (obiage) is tied above the obi. 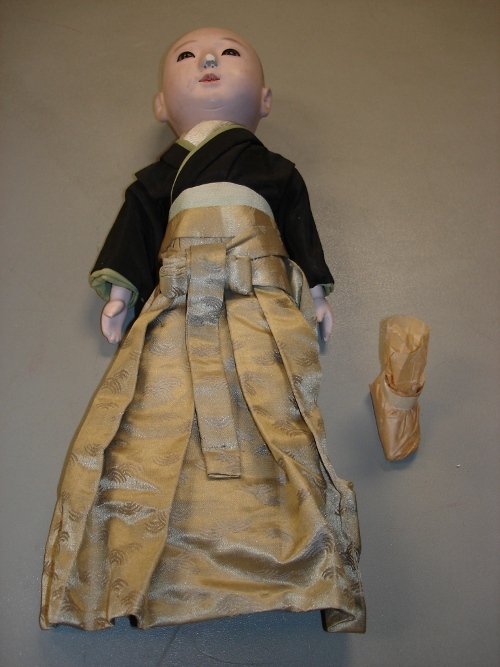 The boy doll is dressed in a black silk kimono; a silver-colored brocade obi is tied around the waist. He wears a gold silk hakama (wrap-around pants) over the kimono. His left foot has broken off. 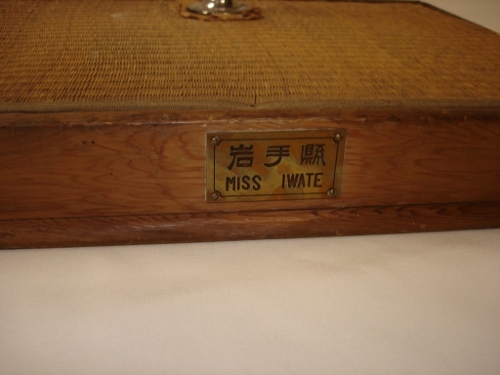 A large wooden tea chest lined with metal contains most of Miss Iwate’s accoutrements. 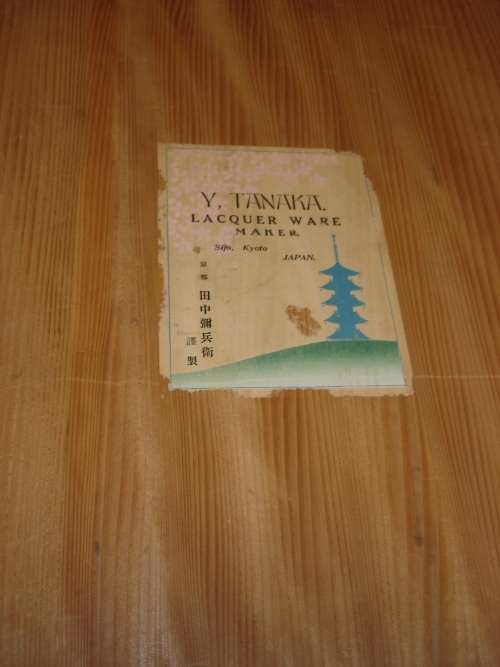 On the underside of the lid is a label stating "Y. TANAKA, LACQUER WARE MAKER". The same information is also written in Japanese. 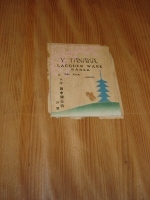 This is the same label found beneath the lid of the box containing the round lacquer box and tea set. The chest measures 18.5"l x 11.5"h x x 17.75" w (47cm l x 30cm h x x 45 cm w). 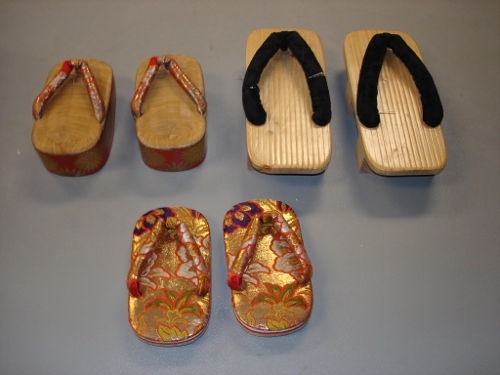 Miss Iwate has several pairs of footwear. One pair is platform sandals with red brocade straps. 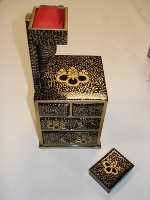 The sides are red lacquer with a gold design. The other pair is gold brocade with brocade straps; it has a floral design in orange, green, and white. The wooden clogs with black cloth straps are probably not hers; they are much too large for her. They seem to have been made for a human child. Miss Iwate has an impressive set of home furnishings. A portion of them is pictured below. Starting in the upper left-hand corner and going clockwise, they are as follows: lamp, chest with five drawers, another lamp, sewing chest, mirror stand, chest with tassels, and small chest with four drawers and a door. The matching pair of lamps is black lacquer. The lampshades are made of translucent fabric, probably silk, with a painted design. The lampshade is 3.5" in diameter at the top; the entire lamp is 11.5" high. The chest of drawers with five drawers is black lacquer with a gold design and silver-colored hardware. The dimensions are: 8" w x 8.25" h x 3.5" d (20cm w x 21cm h x 8.5cm d). The small chest of drawers pictured on the left of the photograph is also black lacquer with a gold design and silver-colored hardware. It has two large drawers, two small drawers, and a door. The dimensions are: 4.75" h x 4.5 " w 5.25" d (12cm h x 11.5cm w x 13 cm d). The mirror stand, like the chests of drawers, is black lacquer with a gold design. Its dimensions are: 4.75"h x 2"d x 3"w (12cm h x 5cm d x 7.5cm w). 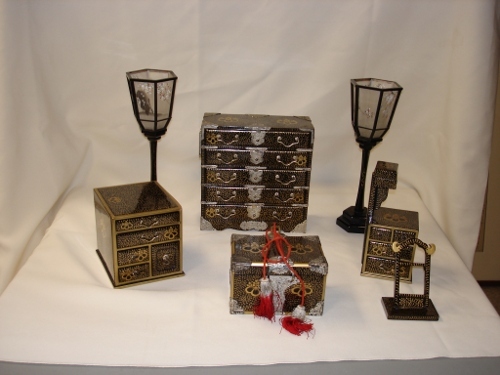 The chest with red and white tassels is also black lacquer with a gold design and silver-colored hardware. It has a removable inner tray. The dimensions are: 3.5" h x 5.5" w x 3.5" d (8.5cm h x 14cm w x 9cm d). 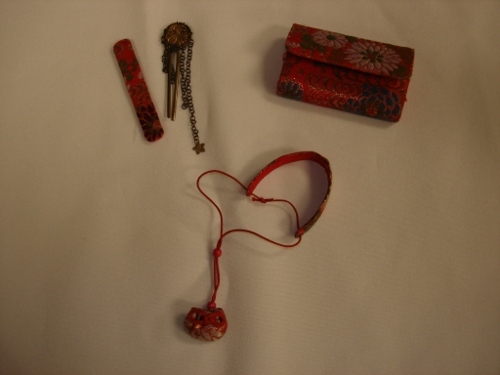 The chest contains a red brocade clutch purse, a tiny red brocade purse on a cord and handle, and a metal hair ornament in a red brocade case. Additional furnishings include: a large lacquered chest, a small lacquered chest, a lacquered shelf, and a box of tea. The two chests match the chests of drawers; they are black lacquer with a gold design and silver-colored hardware. The dimensions of the larger chest are: 9.75"w x 5.25"h x 5"d (14cm w x 8.5cm h x 9cm d). The dimensions of the smaller chest are: 5.25"w x 3.5"h x 3/75"d (13.5cm w x 8.5cm h x 9.5cm d). The black lacquered shelf consists of two shelves supported by four posts. Its dimensions are: 9.5"w x 4.75"d x 7"h (24cm w x 12cm d x 17.5cm h). The tea box is made of wood covered with paper. It is lined with metal. It is filled with real green tea leaves. The dimensions are: 5"w x 3.25" h x 3.25" w (13cm w x 8/5cm h x 8cm w). A bi-fold gold-leafed screen edged with black lacquered wood is shown in the upper right-hand corner. In front of the screen is a charcoal brazier. Coal would be placed in the brazier to heat water in the tea ceremony. 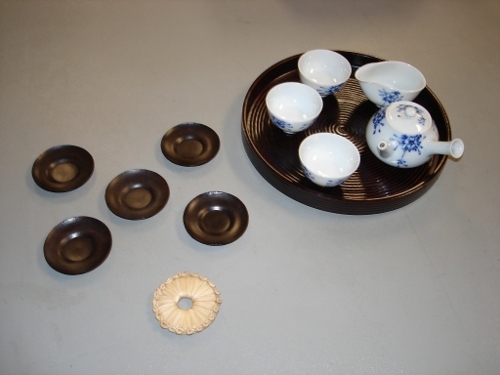 In the lower left corner are two containers for tea with lids removed. 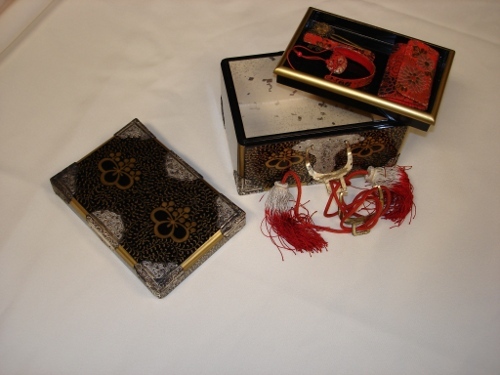 The container on the left is used to hold powdered tea for the tea ceremony. The canister on the right is for leaf green tea. The other side of the screen is covered with blue and white paper. 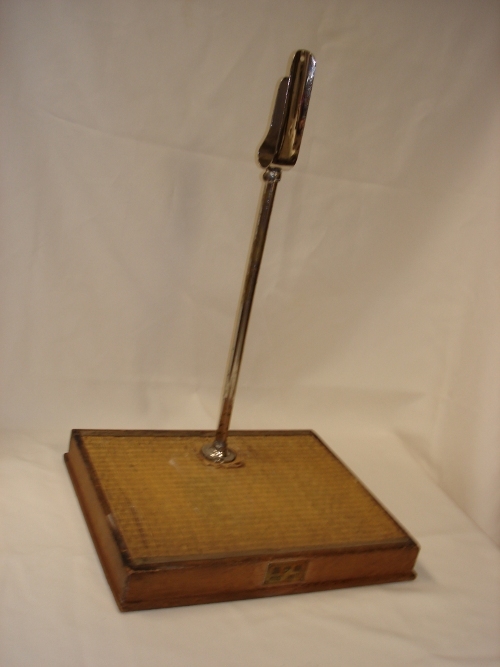 The screen measures 16" l x 6" h (41cm l x 15 cm h). The charcoal brazier is pictured again, this time with the kettle on top of it. 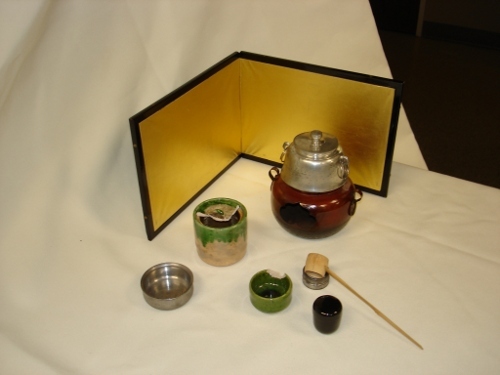 The other objects in the photograph are all items used in the tea ceremony. In the lower left-hand corner is a silver colored metal bowl for waste water. Just above and to the right of the metal bowl is a ceramic water container with a beige and green glaze. Below and to the right of the water container is a ceramic tea bowl with a green glaze. It is chipped in one spot. To the right of the tea bowl is a bamboo water dipper with a metal dipper rest beneath it. 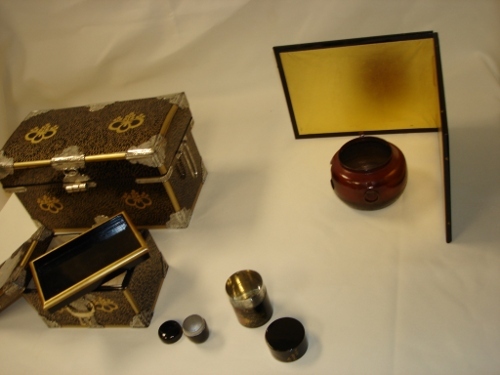 Below the dipper is the black lacquer tea canister shown in the left photograph, this time with the lid on. 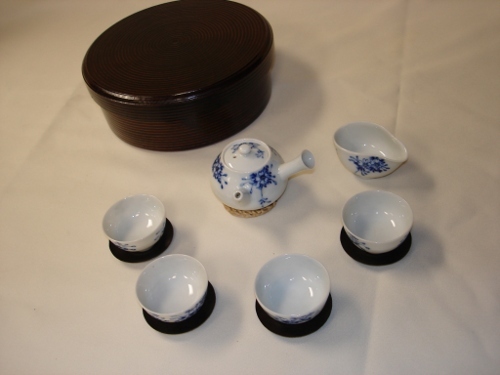 Sake bottle and two sake cups made of white porcelain accompany Miss Iwate. The sake bottle has a floral design in green, red, and gold. The cups have a design of plum blossoms on the inside. 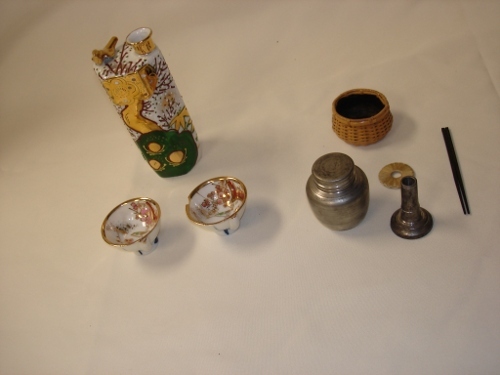 Also pictured are a basket, a straw trivet, a metal canister, probably for green tea, a metal vase and metal chopsticks. The chopsticks most likely would be used for handling the coal in the brazier for the tea ceremony. 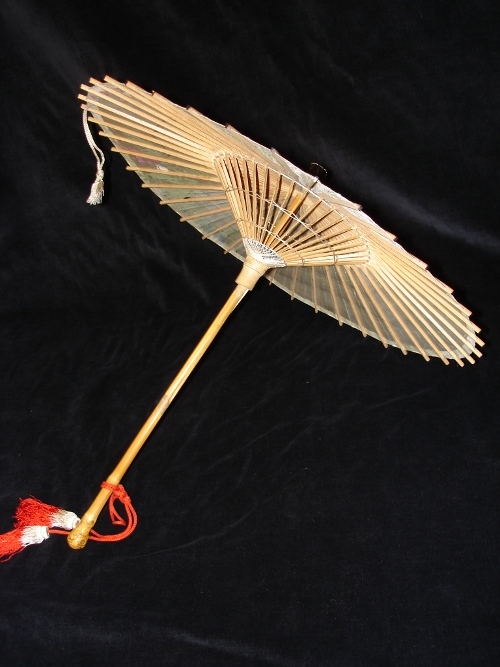 The handle and spokes of Miss Iwate's parasol are made of bamboo. 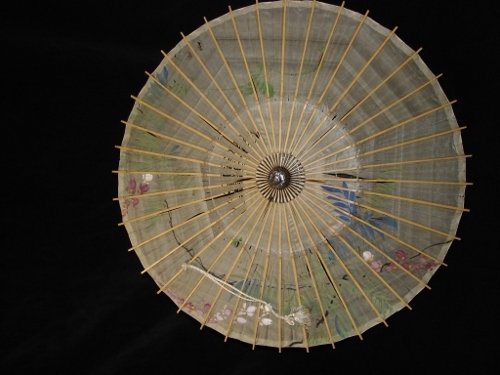 The top is covered in translucent fabric, probably silk, and painted with a floral design. 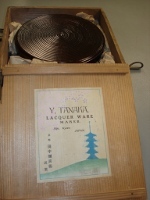 The base of Miss Iwate's stand is made of wood and covered on top with woven rush; a metal post is affixed to the center back of the base. On the front center of the base is a metal plate stating "Iwate sama" in Japanese and "MISS IWATE" in English. 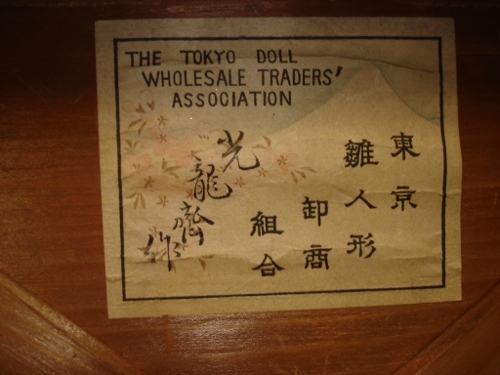 A sign is pasted beneath the base stating "THE TOKYO DOLL WHOLESALE TRADERS’ ASSOCIATION"; this same information is also written in Japanese in the block-like letters. Toward the left are four characters written in a more cursive style; these characters state "made by Koryusai". 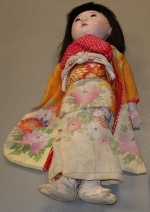 "Koryusai" is the "art name" of the dollmaker. Artists who attain a certain level of skill often take on a "nom de plume".